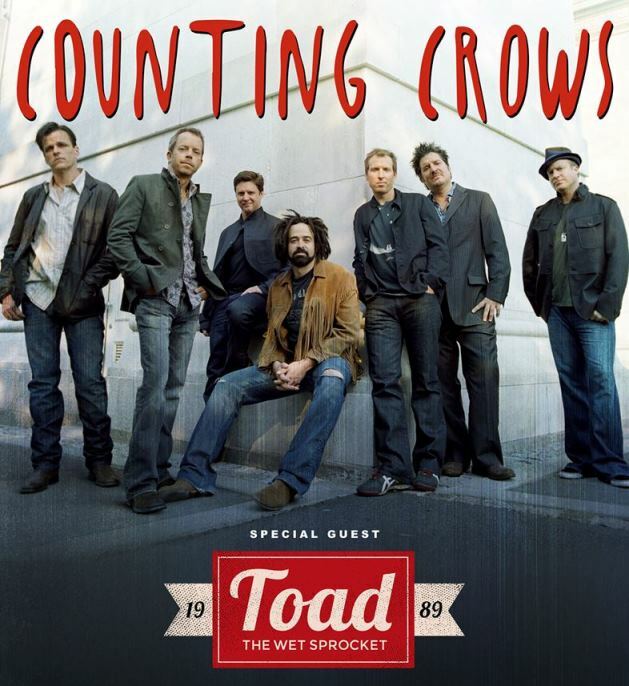 Counting Crows announced today they will kick off a major worldwide tour this summer with new music, starting in North America. The tour will feature songs from the band’s forthcoming album, their first new material in seven years, scheduled to be released in Fall 2014, along with the band’s extensive catalogue of hit songs. Known as one of the most dynamic live bands performing today, the tour will begin June 11 in Tampa, FL and travel through cities like New York, Atlanta, Nashville, Boston, Minneapolis, Phoenix, their hometown of Berkeley, and Las Vegas before wrapping in Los Angeles at the historic Greek Theatre on August 17. Ticketmaster outlets or charge by phone at 800-745-3000. Belk box office at Walnut Creek Amphitheatre. Joining as the tour’s supporting act is Toad The Wet Sprocket, who are celebrating the 25th anniversary of their first LP Bread & Circus along with the release of their most recent LP New Constellation.